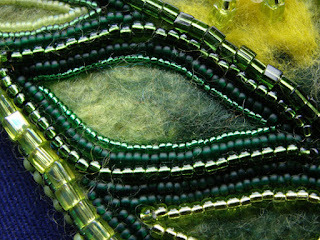 I have been beading away and then unpicking. Sometimes because I would like it neater and sometimes because the leaf or flower ends up too high or low but I'm getting there. I bought different sized beads thinking I would find the little 15's fiddly and want some bigger ones to cover the ground but the little ones are my favourites at the moment. They line up so neatly whereas the cubes twist and turn. Funny, generally I'm not a perfectionist with knitting and crochet, rather than undo mistakes, I leave them in to make it unique and the house is certainly not neat and tidy most of the time. Already thinking about February. There are snowdrops peeping up in the snow. 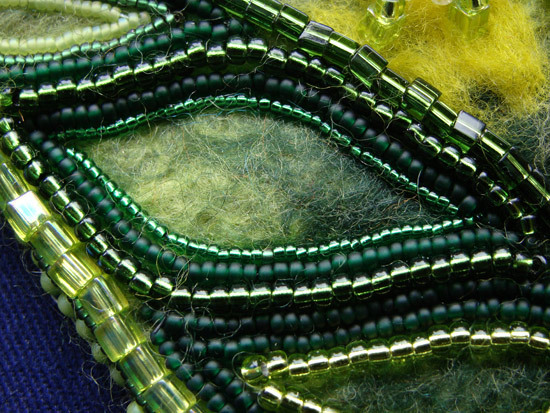 I understand about wanting things to line up perfectly... yep, that's part of the reason why I work with so many size 15 seed beads. However, when I let go of that precision thing, some of my most compelling pieces come forth. So I try to keep myself from scrutinizing too closely. You are so talented! I love the richness of your color choices. This is going to be stunning. What a lovely leaf, and very interesting to look at.